We have arrived in Chicago and are for the most part unpacked. The unpacking has gone on fairly easily and quickly too! Which is a relief after surviving the snow storm in PA that we had to drive through to get here. The Mr and I are both working from home now, so far so good. Finding a new routine here has been fun too, finding new local spots and trying them out. Would you like to see a couple photos of the new place? This one was taken from the sun room…Yes, we have a sun room! 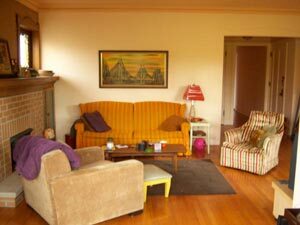 Our old apartment in Upstate NY was just a little larger than the living and sun rooms combined in this place. I still have to giggle now and then at how much space and storage we have here. Bean has been loving chasing her tennis ball up and down the hall….I need to take the downstairs neighbor some cookies and apologize for the noise. 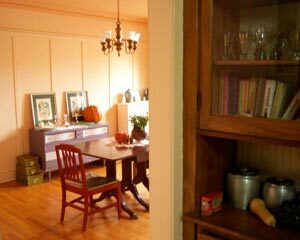 The next photo is from the kitchen of the dining room. I love the built in cabinet in the kitchen, it is large enough to hold my most frequently used cookbooks along with my favorite glassware. We just received the dining table from my parents. It was my great-grandmothers, I’m so excited to finally have room for it! We will be hosting Thanksgiving here for both sets of parents along with what other siblings and friends can attend. It has turned into a joke that dinner will be B.Y.O.C or bring your own chair, since we only have 2 dining chairs as of now. Back to work for me. I need to get some more items finished for the shop. Thanks for stopping by and have a great day! What a beautiful new home! Chicago is a great city!! you have such warm, lovely lighting in your home! it looks so cozy!